Your partner for the sales and servicing of fire extinguishers and other safety equipment. Is Your Apartment Safe in a Fire? Articles and other information related to fire safety equipment and procedures in Illinois. Apartments are a great place to live in the big city of Chicago. You can easily access work, play, and shopping from your home right in the center of the city. There are many properties to choose from. However, you need to know that your building is fire safe and that the emergency lights that are required are in place. Whether you’re a property manager seeking compliance or an apartment tenant, here are the things you need to know when it comes to fire safety in Chicago. When you’re dealing with Chicago fire safety, there are a few things to keep in mind. All of your exit signs have to be in a certain area and range from the doors of the apartments themselves. Any exit sign you have must be located within sight of the exit itself or within 100-feet from the nearest sign. All signs are required to have sufficient illumination and easily read in an emergency situation. The signs can either have internal illumination from inside the sign itself or from a source outside of the sign. The point is it much be well lit for people to be able to see and read where to go. Another aspect of the exit sign itself is that there can be no decorations or furnishings around the sign that may block someone’s view of it in an emergency situation. The sign must be very distinctive in coloring as well so that there’s no doubt where the exit is located. While this may be the last thing on your mind on a normal day, your emergency lights may be what stands between safety and tragedy. In a fire situation, rooms can fill with smoke quickly and the power can also go out. That leaves tenants in the dark trying to find their way out of a very dangerous situation. Emergency lighting is there to assist when the power is out to help everyone get out safely and securely. It is important that as a property manager in Chicago you have the emergency lighting in your apartment buildings tested on an annual basis. These systems are just like your smoke alarms. They should be monitored for any issues, repaired if needed, and kept out of expiration date. One way to make sure your tenants are safe is to have a fire safety inspection on your building. This entails hiring a company such as Connected Fire Safety Services to make sure everything is in order and to date. They can check your fire extinguishers, emergency lighting, exit signs, and all other fire safety aspects. This can help you to give your property owners, tenants, and you, peace of mind that in any fire situation, you are protected. 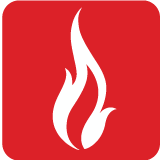 Make sure that you stay in compliance with all Chicago fire safety regulations by working with a highly trained and respected team such as the one at Connected Fire Safety. This will help you keep the lighting in compliance, exit signs in order, and make sure that your property and tenants are safe. Are You Being Fire Safe in Your Condominium? Do You Really Need a Carbon Monoxide Detector? At Connected Fire, we are passionate about fire safety. Our hope is that the information provided through this blog will help you protect your property, residents and business. Please feel free to email any questions that you may have to support@connectedfire.com and we'd be happy to help. © 2019 Connected Fire Safety Services. All Rights Reserved. A subsidiary of Connected Property Management.